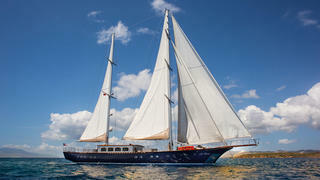 The 35 metre sailing yacht Le Pietre has been listed for sale by Richard Higgins at Camper and Nicholsons. Designed by Onur Tekim, Le Pietre was built in laminated mahogany by Turkish yard Ada Yachts to RINA class and delivered in 2009 as a ketch rigged motorsailer and most recently refitted in 2017. The contemporary interior has pale oak panelling contrasting with dark wood floors and neutral soft goods accommodating eight guests in four cabins. These consist of a full beam master suite and VIP suite, along with a double and a twin convertible to a double, and all cabins have full air conditioning, entertainment centres, television screens and marble en suite bathroom facilities. In the raised deck house the saloon and dining area are open plan. On the starboard side is a comfortable lounge area with a sofa, coffee table and entertainment centre including a Raymarine television screen and a Sonos sound system available in all the guest areas of this yacht for sale while to port is the formal dining area and wet bar, ideal for socialising. A popular charter yacht, Le Pietre comes with a full complement of water toys including a Northstar tender, SeaDoo jet ski, snorkelling gear and a range of towables. Under power, twin 455hp Cummins diesel engines give her a cruising speed of 8 knots. Lying in Turkey, Le Pietre is asking €3 million.